COME on, guys, be truthful. How many of you have ever fantasised about diving into a giant tub of frothy beer? Well, now your heady dreams can come true with a new relaxation treat at Ipswich Massage and Herbal Spa. The venue has teamed up with local craft beer brewer 4 Hearts Brewing to offer customers the chance to soak in a bath filled with beer. In the past decade, beer spas have opened across Europe. 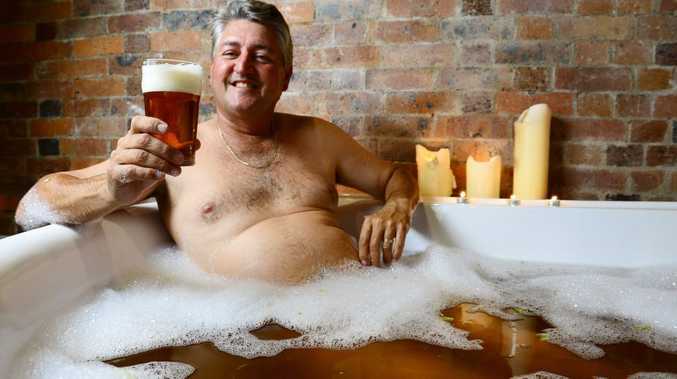 But, according to 4 Hearts Brewing owner Wade Curtis, the beery soak is yet to be offered anywhere else in Australia. Mr Curtis said not only was the bath relaxing, the vitamins and yeast in beer were cleansing for the skin. "Craft beer has many healthy properties. Hops are a sedative, anti-inflammatory and have preservative properties," he said. "And malt includes sugars that can nourish skin." The two and a half hour treatment includes a massage with hop-infused oil, an exfoliation with wheat husks and a bath in a 20 litre tub of 4 Hearts Pale Ale, mixed with hot water and hop flowers. And to top it off, once the treatment is finished, customers can sit back and enjoy a pint of Pale Ale. Owner of Ipswich Massage and Herbal Spa Sonja Glinster said the new package was proving to be a popular gift choice for Father's Day. "We have mentioned it to some of our regulars and they have already booked their dad in." But before lager lovers get too excited, Mr Curtis said the tub was filled with unfermented beer, so drinking the bath water wasn't advised.